For children that are ready to take the next step in toilet training, progressing out of diapers into training pants is a great way to get started. As a child moves from diapers to real underwear, the use of pull-ups or training pants can make the transition easier. This journey to big kid underpants does not need to be stressful at all; in fact, it can be a positive and fun filled trip to the potty. Once your toddler has shown that they are physically and mentally ready for potty training, parents need to know how to tackle the situation properly. The first thing they need to ask is how should I encourage my child to make the switch from diapers to training pants? A great way is to capitalize on your child’s enthusiasm and interest in potty training to foster a positive environment. If your child has relatives, such as older cousins, this can also be used to encourage them to take that next towards being a big kid like their cousin. Dr. Christopher Cooper, who is the director of pediatric urology at the Children’s Hospital of Iowa, identifies this moment of excitement as a great time to introduce training pants to the child. Many children at this stage know the difference between diapers and training pants/pull-ups and can be eager for this next step. An informative article at pull-ups.com states that when your child shows interest in potty training it’s a great idea to introduce training pants at night and then if needed during the day. One thing parents need to keep in mind is that punishing your child for any accidents can have a negative effect. Positive reinforcement for every successful potty visit can go much further than any admonishment possibly could. While encouraging your toddler to become a big kid, explaining and even practicing how training pants work will help your child build confidence. One way to get your child excited about using pull-ups or training pants is to let them keep their pull-ups in the dresser just like big kid underpants. 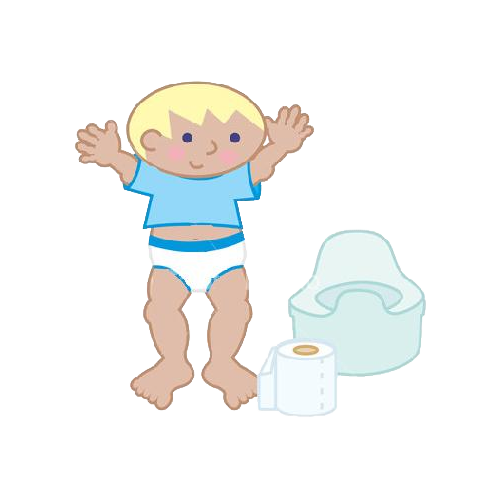 Since they have not been changing their diapers themselves, have your child practice taking them on and off before they start using them or they can even sit on the potty with their training pants on. This can get them excited about the whole process. Since many of these training pants have graphics on them that disappear when they get wet, you can explain to them the difference between dry and wet and reassure them that even though they may have accidents and setbacks they are progressing towards being a big kid. Parents should not revert to diapers since that can be confusing and send mixed messages to the child. Your child will make the most progress if they stay the course. In order to have a successful transition from diapers to training pants, parents need to have a game plan that fosters their child’s excitement to become a big boy/girl. The use of training pants or pull-ups that use a cloth-like material can give children the feel of real underpants. Medline DryTime Disposable Training Pants utilize an easy on and off design and an odor inhibiting polymer to improve dryness, containment, and skin care plus their cloth-like outer cover makes them feel like regular underwear. Not only are they unisex in design, they minimize the risk of irritation and rashes. Some training pants use graphics that fade when wet, such as the First Quality Wonderpants Youth Training Pants. When exposed to moisture their designs fade allowing parents and/or the child to know when to change. They also have soft stretchy sides that allow small hands to pull them on and off easily while providing a feel and fit of regular underwear. One approach to transitioning from diapers is to use training pants that are manufactured and designed specifically for boys or girls. First Quality Cuties Training Pants provides training pants for both girls and boys. They feature a fun fabric character design that fades when wet. They are cottony soft, just like real underwear, and are hypoallergenic. As one can imagine, they are packaged in blue for boys and pink for girls. 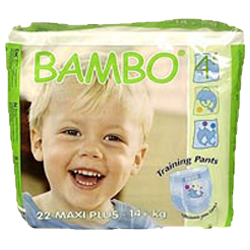 If you’re looking for in an environmentally friendly option, the Bamboo Nature Premium Eco-Friendly Chemical Free Disposable Training Pants are for you. Free from chlorine, perfumes, optical brighteners, and lotions they are ideal for potty training while offering a very small impact on the environment. Their inner fluff is made from 100% sustainable resources while the polyethylene packaging can be used for the production of future plastic products!! Since nocturnal enuresis is not limited to just younger children, the Priva Ultra Fit Reusable Unisex Brief can be utilized for slightly older children whose waste measures 28 inches or larger. They can be worn discreetly under any clothing or pajamas and are completely washable for easy reuse. As the saying goes, you attract more flies with honey than vinegar. The same can be said for helping your child transition from diapers to training pants. You will achieve more success using positive reinforcement rather than admonishing your child for mistakes and accidents. Make it a fun game using all the features training pants offer or reward your child with a small gift after every successful potty visit and it will encourage them to continue their journey towards being just like mom or dad.